There have been many times in Max's life we've cheered him on to move his body. It's not that Max's isn't strong enough. It's that he lacks the coordination from his brain to muscles to sit up, or roll, or stand, or walk. He can kick, he can punch, and he is starting to show signs that he'll one day sit on his own, by balancing for a few seconds without anyone holding him up. He used to scoot all over the floor. He would roll and push himself along with his strong legs. But then he just got bigger, and it seemed he lost the ability to move himself easily. But, in the past little bit, we're seeing him move more and more. Tonight, when I put him in bed and tucked him in, he wasn't too interested in the idea. He kicked the wall next to his bed, and called ah-ah, and aaa-aaa! to try to get me and Steve to come in there and check on him. He wasn't ready for us to be in the other room without him, while he was having to go to sleep! 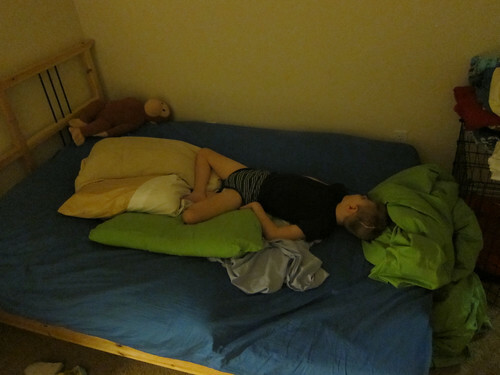 He finally quietened down, and we made our way in to check on him and get ready for bed ourselves. He had turned himself to lay at the foot of his bed, with legs folded. I guess he just needed to find the perfect position to get comfy enough to sleep. I'm letting him rest like that a bit longer, then will have to move him before I go to sleep. Might be time to start considering bumpers around his bed! And all that work tuckered him out! wow, Max you can sure move. Way to go. haha! Yes - perhaps it's time for bumpers. 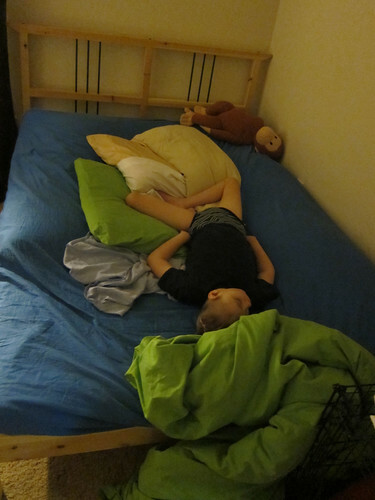 I'm always amazed at the positions these kids can be in and sleep!